Though born and raised in Minnesota, Christopher Gauker is now Professor of Theoretical Philosophy at the University of Salzburg, Austria. 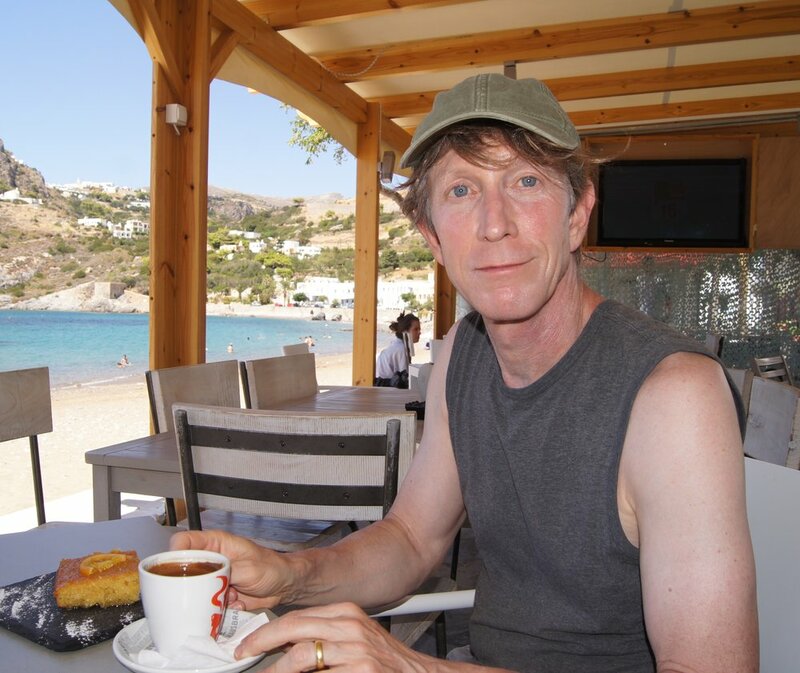 He is shown here in an uncommonly relaxed mood on a beach in Greece. His books include Words without Meaning (MIT 2003) and Words and Images: An Essay on the Origin of Ideas (Oxford 2011). A post by Christopher Gauker. A softball player can visualize the trajectory of a fly ball and her own spatial relation to the ball and by means of that visualization arrive at the spot where it will approach the ground just in time to catch it. An experienced builder of bird houses can knock out a pretty good bird house without having to measure all the pieces, just by visualizing the pieces he needs and cutting them to size accordingly. I can take apart a leaky faucet and replace the washer and then put it back together again. In doing this, I form a sequence of mental images representing the pieces and the order in which they came apart. After replacing the washer I play this mental movie in reverse, until the faucet has been reassembled. Our ability to solve problems on the basis of visualizations in this way depends on the visual knowledge we have of how things move around and interact in space. Our possession of this knowledge is most evident in the distinctions we draw between visualizations of realistic sequences of events and visualizations of fantastic sequences of events. If I come to a puddle in the road, then, if it is not too broad, I can imagine jumping over it. I treat my imagistic representation of the leap as realistic—as a representation of what could really happen. If the puddle is too broad, I can still imagine leaping over it, but this time I recognize that what I am imagining is not realistic but fantastic. I can imagine pouring six glasses of lemonade out of a pitcher full of lemonade. This course of imagination I treat as realistic. Having imagined it, I might actually try to do it. I can also imagine filling twenty glasses from the same pitcher of lemonade, but this I regard as fantastic. I can imagine a woman picking up a five-year old boy and letting him ride on her shoulders as she walks down the street. This I regard as realistic. I can also imagine a five-year old boy letting a grown woman ride on his shoulders as he walks down the street, but this I regard as fantastic. What the examples show is that we have an ability to visualize how things move around and interact in space, and this ability constitutes a kind of knowledge of the way things go. Although I call this ability knowledge, I do not mean that the distinctions we draw are in every way true to reality. Anyone in the 19th century who happened to imagine a jumbo jet might treat that course of imagination as fantastic. It is tempting to try to reduce this imagistic cognition to a knowledge of propositions. The realistic courses of imagination, it might be said, are exactly those that conform to our beliefs, the fantastic those that violate our beliefs. Ultimately, though, this reduction should strike us as implausible. We just do not have enough beliefs to draw all of the subtle distinctions that our visual knowledge encompasses. There are principles of naive physics that we can easily state in words. Stones do not float. People cannot walk up the sides of buildings. But in other cases, there does not seem to be any easily stated general principle that the fantastic courses of imagination violate. Of course, the principles of imagistic cognition, whatever they may be, will be describable in words somehow, but that does not mean that these principles are the contents of people’s beliefs. More generally, I do not think that imagistic cognition can be adequately understood on the model of discursive reasoning by means of propositionally contentful thoughts. As far as I know, no one, whether in psychology or philosophy, has ever tried to characterize the visual knowledge illustrated in these examples. Of course, we have had the Gestalt psychology movement and its contemporary successors (Wagemans et al. 2012), but these do not address problem-solving or the real/fantastic distinction. We have had the mental imagery debate (Kosslyn 1995, Pylyshyn 2002), but there the question was whether there is any convincing experimental evidence that mental imagery really exists. We have had the hypothesis of the intelligent eye (Gregory 1979), but that concerns the nature of visual attention and search. We have also had studies of naive physics, especially in infants (Spelke 1990). This last line of research is certainly relevant to the question of imagistic cognition, but the result has generally been an attempt to describe the propositional contents of infants’ thoughts ("Unsupported objects fall"), whereas, if I am right, our visual knowledge does not reduce to such propositional contents. Possibly one could attempt to characterize our imagistic knowledge in purely neurophysiological terms. But that approach is probably not a task for philosophers, at least not for this one. What philosophers might seek, however, is a characterization in terms of the representational contents of imagistic representations. There is currently in the field of philosophy a lot of interest and research on the topic of perceptual representation (Gauker 2012). From this starting point, philosophers might turn their attention to the nature of imagistic cognition. The work on perception that is most promising in this respect is that which does not assume that perceptions have propositional content. My hope is that the distinction between realistic and fantastic courses of imagination, and more generally the principles of imagistic cognition, can be defined with the help of this conception of imagistic representation. An unrealistic mental image of a spatial configuration (such as a mental image of the Penrose triangle) is one that cannot be mapped onto an object in space in accordance with the pertinent mapping relation. A realistic course of imagination representing a sequence of events might be explicated as one that pieces together representations of events that are based on actual experiences. The way in which the pieces are based on actual experiences is that the representations result from taking perceptions of actual events and uniformly translating them across the dimensions of perceptual similarity space. For instance, having observed a dance danced slowly, we might imagine speeding it up. I will close with an advertisement, although there is nothing to buy. Bence Nanay (University of Antwerp) and I have been awarded funding for a four-year project on "The Puzzle of Imagistic Cognition", which begins on October 1, 2018. The funding comes from the Austrian FWF and the Flemish FWO. We are, or will be, funding one four-year doctoral fellowship, three two-year postdocs, and two workshops. The doctoral fellowship has already been awarded to Stephen Müller, and the first of the post-docs has been awarded to Thomas Raleigh. We will welcome applications this Fall for the second of the post-docs (watch for the announcement on Philos-L). Gauker, Christopher. 2012. “Perception without Propositions.” In John Hawthorne and Jason Turner, eds., Philosophical Perspectives 26: Philosophy of Mind, Wiley, pp. 19–50. Gregory, Richard L. 1970. The intelligent eye. McGraw-Hill. Kosslyn, Stephen F. 1995. “Mental Imagery.” In Stephen F. Kosslyn and Daniel N. Osherson, eds., An Invitation to Cognitive Science, MIT Press, pp. 267–296. Pylyshyn, Zenon. 2002. “Mental Imagery: In Search of a Theory.” Behavioral and Brain Sciences 25: 157–182. Spelke, Elizabeth. 1990. “Principles of Object Perception.” Cognitive Science 14: 29–56. Wagemans, Johan, James H. Elder, Michael Kubovy, Stephen E. Palmer, Mary A. Peterson, Manish Singh, Rüdiger von der Heydt. 2012. “A Century of Gestalt Psychology in Visual Perception: I. Perceptual Grouping and Figure-Ground Organization.” Psychological Bulletin 138: 1172–1217.